In certain jurisdictions, an alias summons becomes necessary when an original summons expires before the defendant can be successfully served. Speedy process servers and instantaneous skip-tracing can prevent most summonses from expiring, but for a high-volume practice, alias summonses are a savvy way to restart the clock and serve every possible case. In March, 2019, ABC Legal is releasing new software that will significantly improve the performance and efficiency of the Florida alias summons workflow. 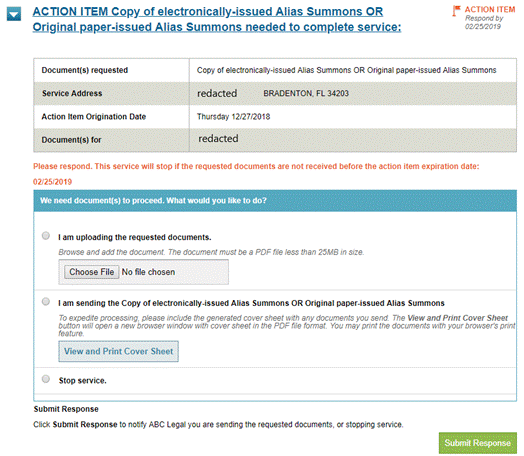 Rather than require you or your team to respond to Action Items by creating and uploading Alias Summons documents, we’re creating a solution that allows for little to no effort from your team . . .
With ABC Legal’s FL Alias Summons Automation, ABC Legal will generate and e-file an alias summons for you, automatically, saving your team time and effort while working for the highest service rate possible. If you’d like to take advantage of this service please contact us for details of what this service will look like (what we do, how quickly, and what you get back) and how to turn it on.